Theeb is set in the time of the Great Arab Revolt against the Ottoman empire that occured during World War I. It tells the fate of a young Bedouin called Theeb (arabic for Wolf) and his brother Huseein, who live a traditional Bedouin life in the Jordanian desert of Wadi Rum. When a British officer asks them to guide him through the desert to strategically important Ottoman train tracks, they too become caught up in the world events of 1916. 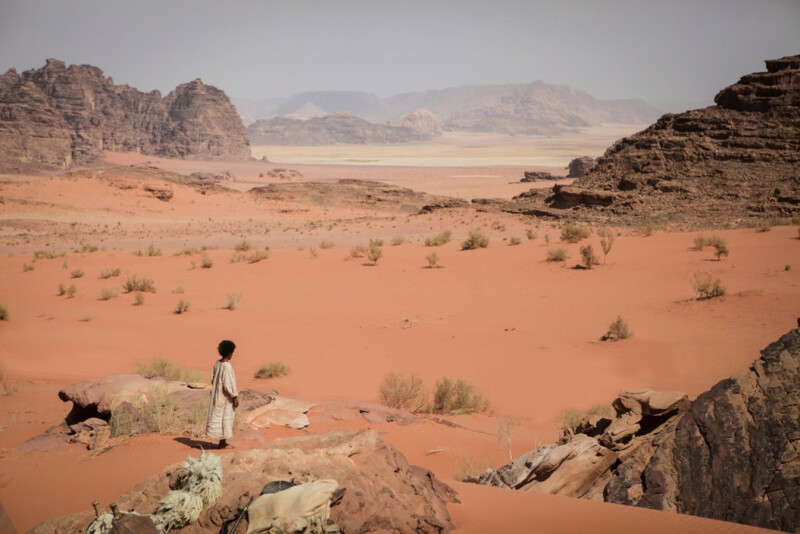 The desert landscape of Wadi Rum plays a leading role in Theeb. Director Naji Abu Nowar decided from early on that the majority of the scenes had to be shot in Wadi Rum, despite the logistical challenges this presented. Scriptwriter Bassel Ghandour and Naji moved to the Bedouin village of Shakrieh a year before the shoot in order to immerse themselves in the Bedouin lifestyle. Authenticity was extremely important to the filmmakers, which is why Naji cast two local Bedouins in the leading roles, despite the fact they had never done any acting before. Theeb and his brother Huseein were performed by local Bedouins Jacir Eid Al-Hwietat and Huseen Salameh. Sand and heat were constant companions during the production and the crew's vehicles often got stuck. Some of the more remote locations required off-roading for an hour each way. Actor Jack Fox, the only non-Jordanian cast member, suffered especially under the harsh conditions. Yet all this hardship was forgotten when the film started to collect accolades around the world - winning awards at film festivals in Dubai, Abu Dhabi and Venice, as well as at the British Academy Awards and a nomination as Best Foreign Language Film at the 88th Academy Awards in 2016. While the movie was shot in three different locations (Wadi Araba, Daba'a and Wadi Rum), Wadi Rum was the most important location for director Naji Abu Nowar. It provides the setting for the main part of the story, in which Theeb and his brother Hussein accompany a British soldier (Edward) and his Arab guide (Marji) along the so-called 'pilgrim's trail' to reach a mysterious Roman well. As they reach their destination, they discover a group of Bedouins in the distance who seem to be watching them. The location of the Roman well was one of two that Stefan visited along with actor Huseen Salamah in July 2017. Marji signals the Bedouin warriors in the distance. Are they friend or foe? The second location Stefan visited was a small canyon, which was used as a campsite before the group reaches the well. It's a lovely, shady spot and ideal for a picnic. Theeb and Huseein observe Marji and Edward while discussing whether to proceed with the mission or return home. The location of the Roman well is on the northern side of the Wadi Rum road at 29° 48' 36" 35° 27' 21" or 29.81 / 35.455833. The location of the campsite is within the perimeters of the actual Wadi Rum National Park at 29° 38' 36" 35° 27' 42" or 29.643333 / 35.461667. If you're keen to explore more of the locations from this movie, then get in touch with Huseen Salamah who plays Theeb's brother Huseein. He lives in the Wadi Rum area and is always happy to show visitors around. The best way to contact Huseen is either via Facebook under the name 'Hoseen Alshoulheen' or by phone +96 2772 189326.